If you’re an experienced gardener or someone who is just entering the world of growing plants, knowing how to raise pH in soil with baking soda can be really helpful. Before even regulating pH levels you should first find out if you even need to change anything, perhaps your plants are already getting the proper care they need. In order to do this, you will need some valuable information which you can easily find out. What we mean by this is the needs of your plants, do they need an acidic soil or an alkaline one? Which levels can even be considered one of these categories? Plants are commonly set up in soil with pH levels ranging between six and seven. If the pH is over 7 then your soil is alkaline, if it is less than 7 then it is considered acidic. Not all plants prefer pH levels in the previously mentioned ranges, some plants like lilies prefer an environment with less than 6 pH levels. Is It Safe To Change pH Levels With Baking Soda? Once you know the pH of your soil and which target level you should go for, all you need to do is change the pH according to your plants. But how do you exactly do that? Is it even recommended to change the natural settings of your plants? Are there any side-effects? If you’re worried about any of these things, there is no real reason to be. Most gardeners tend to change the pH levels if they have the need, this is a common practice that is prevalent worldwide. 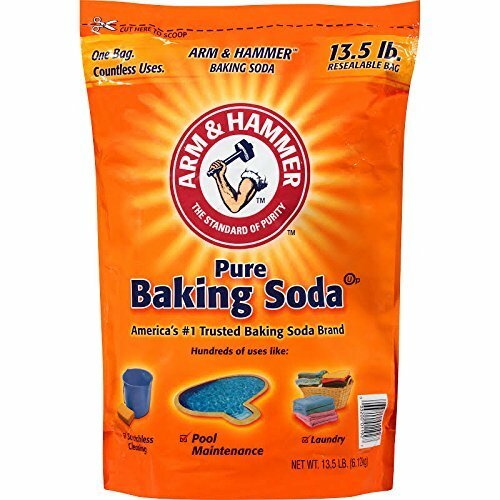 There are products that are specially designed to regulate pH levels, but if you just want an easy and cheap way to do it, then get baking soda. Baking soda is common in everyone’s home and it is useful for cooking and cleaning as well. It has a purpose in gardening as well. If you make a baking soda solution you can use it to change the pH levels of your soil. It is also useful for removing black spot fungus on plants such as roses. Vinegar serves the same purposes and it can also be used for gardening. You can even spray it to eliminate weeds. In the end, we prefer baking soda when it comes to gardening as it is more effective for regulating pH, which his important if you want to maximize the efficiency of your plants taking nutrients from the soil. In order to change anything with your soil, you need to determine the current pH levels of it. Finding out the exact numbers is quite easy and cheap as well. All you need to do is buy a pH test kit or pH meter and test it out. The results of these test kits and meters are quite accurate, they come with instructions but all of them work in a similar way. Generally, you should get a tablespoon of the soil that you want to test and place it in a cup. After that, you need to add water which is distilled. Stir the water and wait up to 5 minutes or the time recommended by the package. Now you have to insert the meter or the test kit paper strip in the cup, again wait for the time described by the package and see what levels the kit or meter reads off. If the pH is compatible with the plants then you’re done. If not, follow the next steps. If you don’t have a pH meter or a pH test kit, then you could also use other methods that are easy to and instantly available. You can make a DIY version of a pH test just by using baking soda and vinegar. Get two test samples of your soil from the same area and add distilled water to both cups. Now you need to stir and wait up to two minutes. To one cup add baking soda and to the other one add vinegar, a tablespoon for both cups. Observe the cups and notice any changes, if the cup filled with vinegar starts bubbling then the soil is alkaline. If you notice that the baking soda cup starts bubbling, then your soil is acidic. If your plants need an alkaline soil and if you noticed with the previous tests that your soil is acidic, then prepare baking soda. Changing the pH levels will be easy and you won’t need any enormous amounts of baking soda, the steps for this process are easy as well. All you need is only one tablespoon of baking soda and one gallon of water. Mix these two ingredients and apply the end result onto your soil. You should only do this once and you shouldn’t put a large amount of the mix in your soil as it could create a disbalance. After a day has passed, you will need to test your soil again and see if you were able to increase the pH levels. You need to do one of the two methods explained previously, for the best results and actual numbers. We recommend that you get a real pH meter or pH test kit instead of the baking soda and vinegar solution. If the results returned positively then congratulations, you have finally made it easier for your plants to grow and consume rich nutrients filled within the soil. Now that you have completed all these steps, we only urge you to keep doing these steps regularly. Perhaps not every week, but it is recommended to do that on a monthly basis. pH levels are often very stable with no extreme changes, but over time they can change due to various other factors. If the levels aren’t correct, then you will have to repeat the steps all over again, but knowing how to raise pH in soil with baking soda will be valuable for your plants. The root of your plants absorbs mineral nutrients which are essential for their well-being. The most important elements are nitrogen and iron which they consume once they are dissolved in water. If your soil is too acidic or too alkaline for the roots of your plants, then these nutrients won’t be dissolved easily and your plants won’t be able to absorb them.